The Hellkat is an all-new gravity tyre, developed with UR Team pro riders. An optimised tread design lets you rip across a wide range of conditions, never letting you down through sharp turns or aggressive braking. Equipped with Advanced Gravity Casing, the Hellkat is unimpressed by any sharp object you may encounter on your ride. Don’t be just fast - be fast as hell! 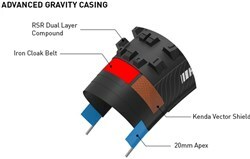 Advanced Gravity Casing (AGC) - KVS and Iron Cloak help prevent cuts and punctures, and a 20mm apex reduces the chance of pinch flats or burping. Versatile - Tread design is optimised for a wide range of conditions balancing traction, handling and rolling speed. The KVS is a woven sheet of aramid fibres laid up across the sidewall of a tyre which offers a light-weight casing shield with 285% higher cut resistance than standard protective materials, this allows for a reduction in the casing weight by up to 200grams when compared to traditional 2-ply downhill casings. A breaker of one of Kenda’s best puncture resistant materials, Iron Cloak, is built in directly underneath the tread rubber only, for protection and minimal weight. Iron Cloak Belt lets you rest assured that your tyres are durable, but light and super supple for the ultimate in riding performance. RSR is a tyre designed for race conditions with a compound that takes grip to a whole new level. With a 42sA, the RSR compound is super soft and sticky for a variety of surface types and conditions. The soft compound provides not only superior grip but also works as a small degree of independent suspension as each tyre knob flex and reform on the trail surface. Designed to further complement Kenda's rubber compounds for downhill and slalom tyres, RSR is perfect for European World Cup conditions as well as the local gravity park.